Specializing in the science, study, and measurement of behavior, psychometricians are well-versed in the division of psychology responsible for designing the various ways one can access and determine the personality traits, intelligence, emotion, and skills of an individual. Professionals with a background in psychometrics become valued team members in a wide range of job environments, including human resource offices, schools, and correctional facilities. What Type of Positions Can a Psychometrician Hold? Psychometricians can find work in many different fields and job environments, including market research, hospitals, mental health clinics, large corporations, software development companies, and educational settings. All of these potential employers benefit from hiring a professional who is trained to measure psychological responses. (1) A psychometrist typically works under the guidance of clinical psychologists and neuropsychologists administering psychological tests instead of influencing the design of these tests. In order to become a psychometrist, you will almost certainly need an undergraduate degree, although it doesn’t necessarily need to be in psychology or a related field. Depending on the employer and work environment, a tiered system is often used by various employers to categorize the different kinds of positions available to a psychometrist. Those with increased responsibilities (such as training junior psychometrists) tend to occupy a senior position and may hold a title such as Lead Psychometrist. Conducting pilot trials for test methods and analyzing data to determine the success of testing methods at a college or university. Becoming a director of a psychometrics program, like the Assessment Program at the American Institutes of Research (AIR). Conducting ongoing statistical research at a company to maintain, increase, and protect the scientific validity of their products and services. Creating, scoring, monitoring, and validating licensing and certification exams for a professional accountant certification association. Working for testing companies on the federal, state, or local government level. Assuming the role of a consultant or advisor to management and educational directors. Training and overseeing the education of aspiring psychometricians. Teaching Quantitative Psychology or Psychometrics courses at the university level. "Psychometricians are legal in most states. They are currently not legal in NY, so [there are] no jobs there." Learn more about how to become a psychometrician. A psychometrician that is more visible in the field tends to have a better chance catching the eye of potential employers. Attending local psychology-related events is one way to network with the companies, businesses, and health care institutions most likely to hire a psychometrician. Joining a professional organization, like the Psychometric Society, can also help a psychometrician stand out from other job candidates. Professional certification also displays a psychometrician's commitment to the field and can set them apart from other applicants. The Certified Specialist in Psychometry credential is available to those who have obtained at least a Bachelor's degree and 3,000 hours of experience in the field; or a Master's degree or PhD with 2,000 hours of experience. 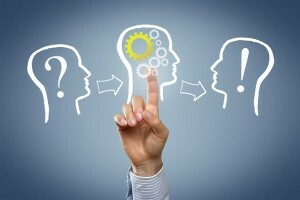 Learn more about online psychometrics degrees. Experience in quantitative measurement and statistics. A good eye for detail and sharp analytic skills. The ability to effectively explain complicated ideas. The ability to conduct high-level interaction with a range of corporate team members, consultants, clients, consulting psychologists, and other employees. "A vital skill is being able to speak to content experts about how measurement issues may apply to their field in relatively non-technical language." Since industrial-organizational psychology is closely related to psychometrics, going back to school to complete coursework related to the field can expand the number of options available to a psychometrician looking to increase his or her salary. "Being able to show some impact of one's work would be key, including traditional publications or even summary reports on the final outcome and uses of one's measurement efforts"
Contributing to online journals and other publications also demonstrates to employers a psychometrician's desire to thrive, learn, and grow within the field. Attending a targeted conference not only provides an excellent opportunity to connect with other psychometricians, but also facilitates networking between professionals in related fields. This is generally achieved by participating in various events, such as meet-and-greet socials, breakfast buffets, workshops, and roundtable discussions. Morrison cites the National Association of Psychometrists (NAP) as an especially helpful resource for the psychometrics field that allows professionals to gain an edge within the industry. Every year, NAP hosts a conference that rotates locations across the United States and Canada with past events held in Puerto Rico, San Diego, Nashville, New Orleans, and Vancouver. Developing expertise in a content area where one can easily apply his or her current psychometric knowledge is another way to build a starting point for the best networking opportunities to flourish outside of the field. "Network with colleagues (mostly non-psychometricians) in the area concerning the relevance of [your] work to their own research, which is often more clinically focused." One of the ways that a psychometrician can develop his or her career includes earning CE credits and maintaining certification, when applicable. As of 2015, professional psychometrists will be obligated to earn 20 continuing education credits every two years with a requirement of completing at least three credits in Ethics. Read our fantastic interview with Expert Psychometrician, Dr. Kevin McGrew, Founder of Institute of Applied Psychometrics.